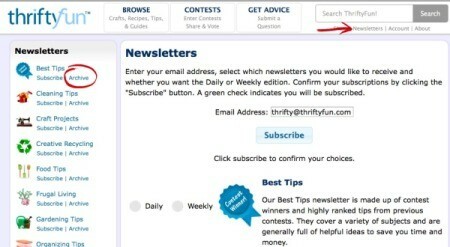 Problems opening links in the ThriftyFun emailed newsletters are usualy caused by a virus scanner or email browser that block links from within an email. For some email systems, adding thrifty@thriftyfun.com as a contact will do the trick;others have an option to trust the sender; and for others you need to to report the problem to the vendor. Virus Scanners often have a website where you can report any "false positives". Please contact your email or virus scan support to report the issue. We would be happy to work with them and send test emails or anything else they need to trouble-shoot. In the meantime, copies of the newsletters are available on our website. Click on the Newsletter link at the top of the site, to access the Newsletter Subscription page. In the Newsletter submenu, you will find each type of Newsletter with an Archive option. Selecting Archive will allow you to view newsletters back to February 2012. Generated 2019/04/18 10:24:38 in 174 msecs.